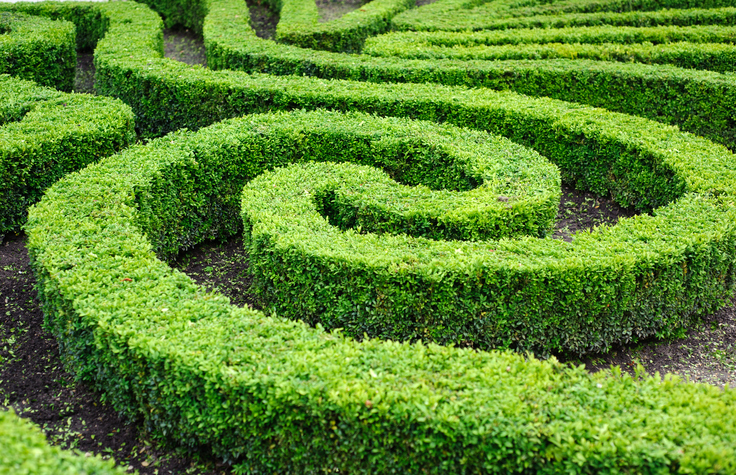 Hedges can be used to make mazes. A hedge is a row of bushes or small trees that forms a barrier or boundary or, more generally, anything that forms a boundary or barrier. It is also an action taken to protect something, such as an investment, from risks and a statement that does not commit the speaker to something or does not answer a question directly. As a verb, to hedge means ‘to enclose with a hedge’ or, often followed by in or about, ‘to restrict as if putting up a hedge.’ To hedge is also to reduce the negative effects of a possible loss by favoring or supporting more than one side, most often in the expression “hedge your bets.” If you refuse to answer a question directly, you are hedging. The garden was surrounded by a tall hedge. The politician had to make her way through a hedge of microphones outside her office. The businessman set up a hedge around his investment. The senator used a series of hedges to avoid answering the question. The farmer hedged her fields. The poet felt hedged in by the rules of the language. The country's leader decided to hedge his bets by lending support to both sides in the conflict. Instead of answering the interviewer's questions, the politician just kept hedging. Hedge can also be used as an adjective to mean that someone is considered inferior. It is used in combination with various names of professions, such as hedge-doctor or hedge-lawyer and takes its meaning from such people conducting their business at the roadside (which would often be bordered with a hedge), rather than having proper business premises. Of course, this way of working is no longer common and so this use of the word is falling out of common usage too, but you may still come across it in older books. Hedge dates back to before the year 900. The Old English hecg, later hegge in Middle English, originally meant any type of fence. It comes from the West Germanic hagjo, and can be traced back to the Proto-Indo-European root kagh-, which meant both ‘to catch or seize’ and ‘wickerwork or fence.’ It is related to the Middle Dutch hegge, the Dutch heg, the Old High German hegga and the German Hecke (all meaning ‘hedge’). It is also distantly related to Latin caulae (a sheepfold, enclosure), the Gaulish caio (circumvallation) and the Welsh cae (fence or hedge). Its figurative use as boundary or barrier dates back to the mid-14th century, while the idea of someone practicing their profession marginally (hedge-doctor, hedge-lawyer, etc.) dates back to the early 16th century. The verb comes from the noun, and first appeared in the late 14th century, meaning ‘to make a hedge’ or ‘surround with a palisade.’ The meaning ‘to dodge’ is from the late 16th century, and comes from the idea of hiding in a hedge. The meaning ‘to insure against loss’ in betting or in business is from the mid-18th century.